Today it’s the Green Sauce on center stage. 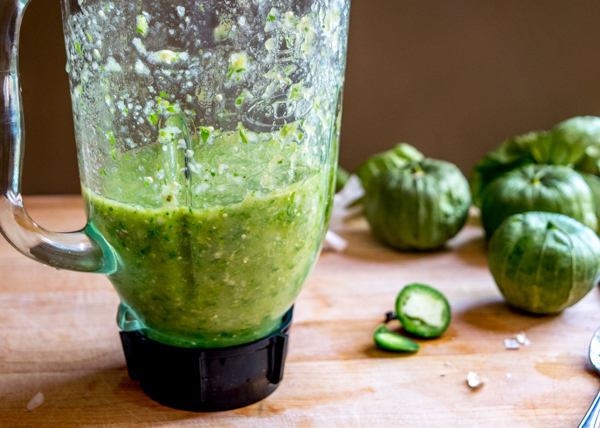 Otherwise known as Tomatillo-Serrano sauce, or Salsa Verde, or Mexico’s #2 salsa. A homemade green sauce can transform eggs, slow cooker carnitas, and enchiladas into something otherworldly– so getting good at whipping up this beauty opens up loads of instant possibilities. 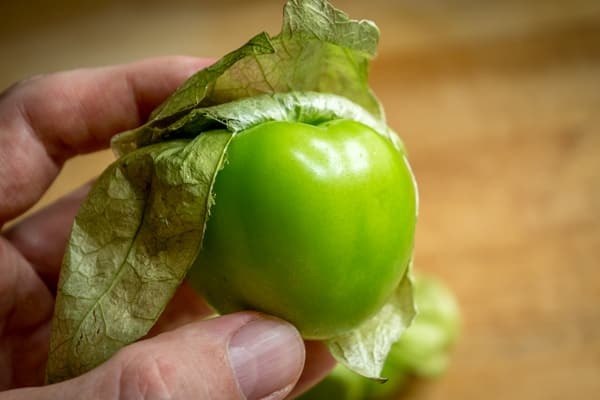 Most supermarkets these days have a basket of tomatillos tucked away in the produce section. 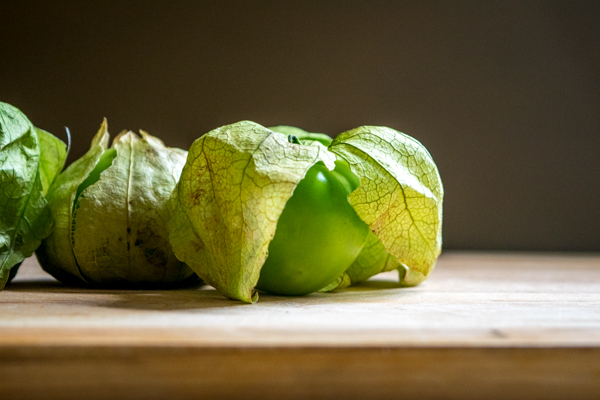 Note: If you’re in an area where fresh tomatillos are hard to come by, you can always use canned tomatillos. Yes, it’ll be a slight step down in quality, but the results are still far superior than using storebought salsa. 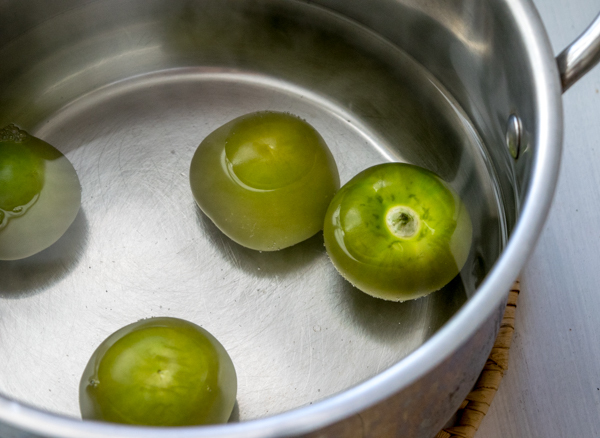 And don’t worry about roasting tomatillos out of the can, it doesn’t have the same effect as roasting fresh tomatillos. OK, got 4 tomatillos handy? Pull the husks off, give them a good rinse, and cut out the stems. 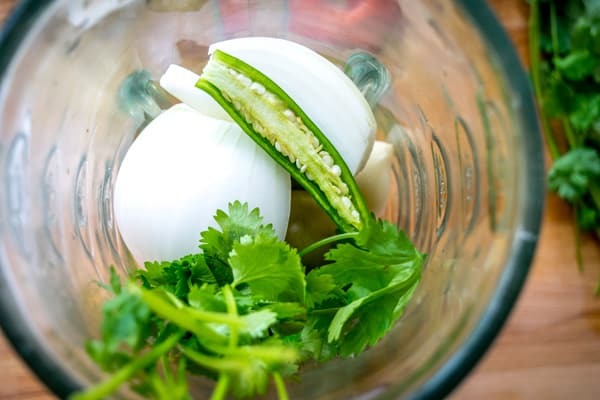 Into the blender they go along with ½ onion, garlic, cilantro (using the stems in Mexico is the norm), and only 1/2 of the serrano pepper. You could also use a molcajete to make the salsa. Pulse blend and taste for heat level. Not enough? Keep adding serrano until it tastes right to you. And that’s it! You just made the second most popular sauce in the history of Mexican cooking in less than 20 minutes. Having this sauce on standby in your kitchen is a gamechanger. Sure, it does well next to a bowl of chips. But it really shines when used generously in breakfast burritos, or gooped on top of burritos, or smothering pork carnitas. 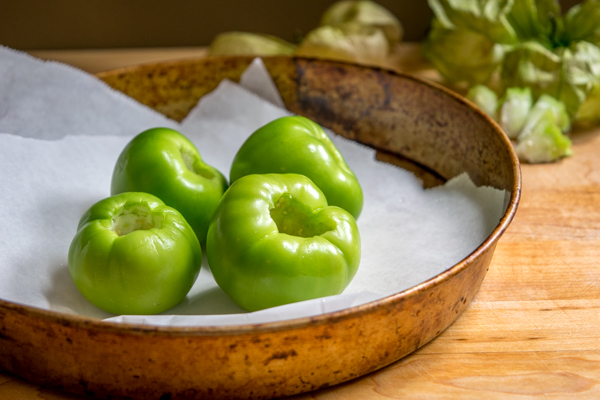 One last note: you’ll typically find serranos next to jalapenos in the produce section, but if your local markets don’t carry them you can substitute jalapenos for the serranos and you’ll get a similar result. 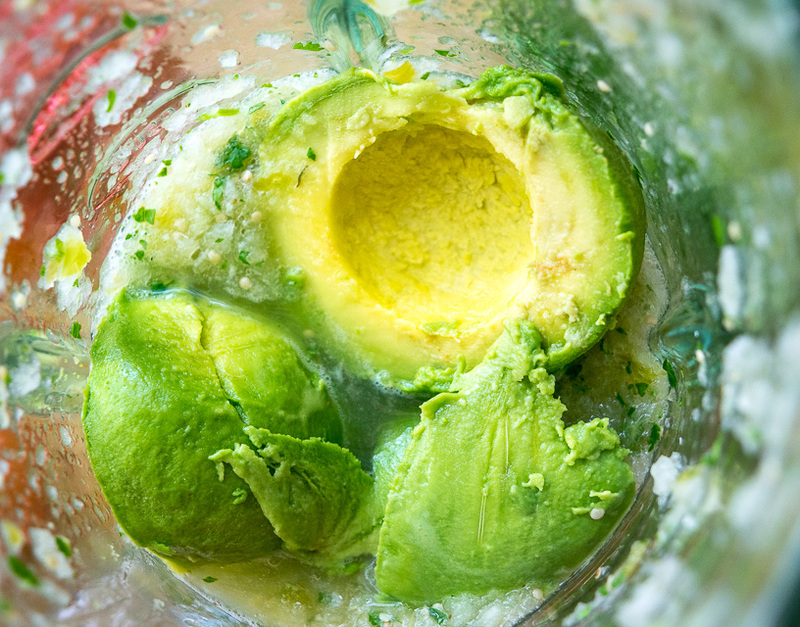 Add an avocado to this recipe and you’ve got a delicious Avocado Salsa Verde. 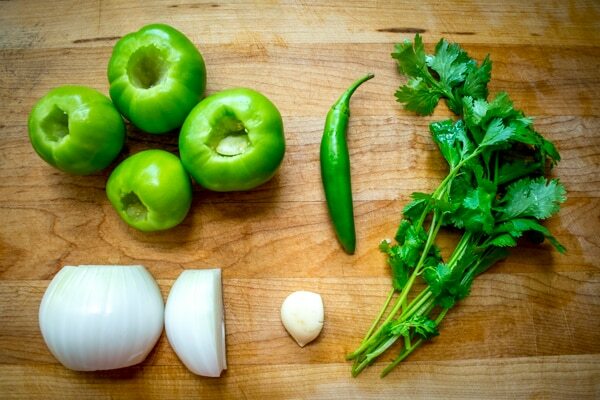 You can also use a chipotle in adobo to get a delicious Tomatillo Chipotle Salsa. 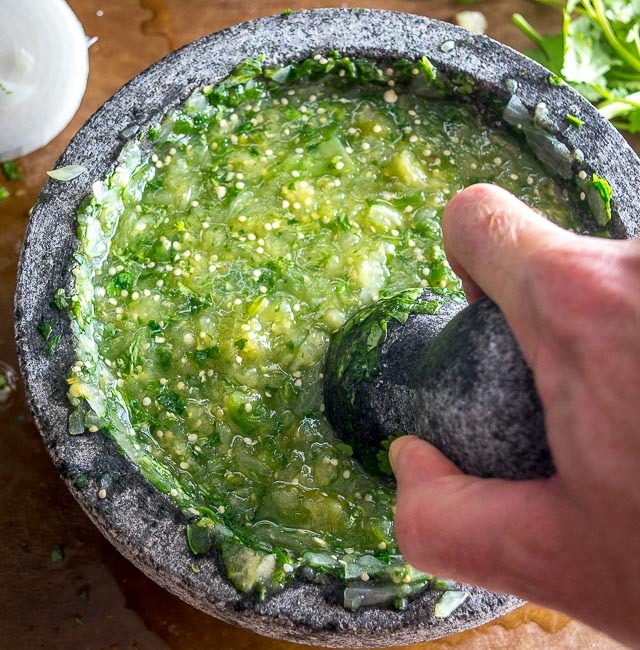 And here is a link to making a molcajete version of this awesome green salsa. Remember always you must wash the tomatillos very well, you can use soap if it’s necessary, because they have a strong bitter flavor in their skin, and that could do a mess with the sauce. 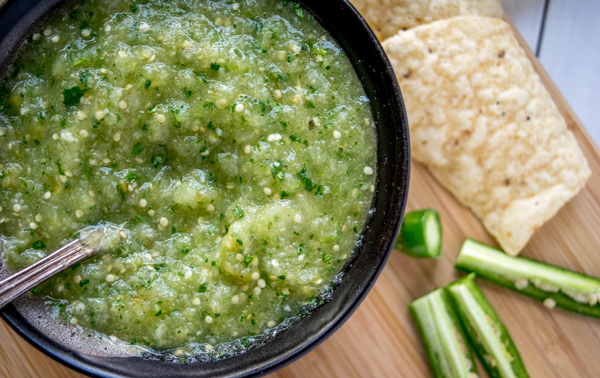 You sure make this tomatillo salsa verde look so easy! I’ll have to make it soon! What degree do I roast the tomatoes and is it half side down or up? Can’t wait to try! Hola! For roasting the tomatillos I usually use 400F. And for both tomatoes (plum) and tomatillos I roast them whole. Let me know if you still have any questions. Good luck! Hi Pamela! This salsa should keep for at least a few days in the fridge, but you might notice that it loses some of its zing after a day or two. You can re-season it or try adding a splash of vinegar to make it last longer, but to be honest I’m in the habit of making small, fresh batches as opposed to larger batches. Hope that helps a bit! pour some into ice cube trays, freeze and toss em in a ziploc. when you need some just grab a cube… will last for months. This was super easy and full of flavor! Thanks for sharing a great recipe! Awesome Theresa, thanks much for your note! I’m always amazed how much flavor you can get from so few ingredients in this salsa. Made this today and it was so delicious and addictive. It was a simple recipe, no fuss and taste amazing! Thank you! Awesome Mary, thanks much for the feedback! I’m regularly amazed at how much flavor you get in this recipe from so few ingredients. Cheers. Delicious y just add some lime and oregano and canned!! Thanks Vinia, sounds like some great additions! How come you don’t roast the garlic and onion as well? Thanks! Hi Alex! 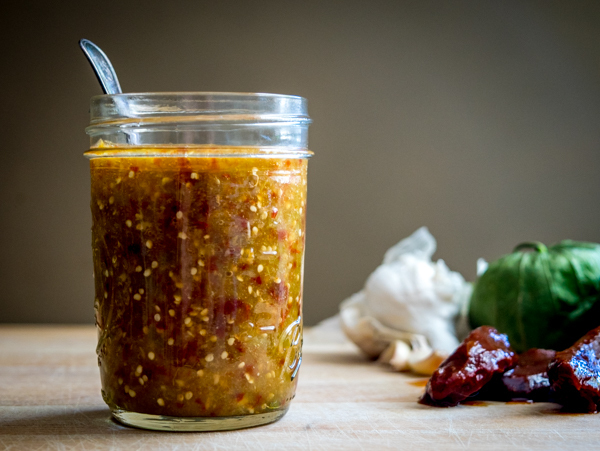 You can roast the garlic and onion if you want to, but I find that this mellows their flavor a little bit — I think I prefer the sharpness from the raw garlic and onion in most salsas. Cheers. 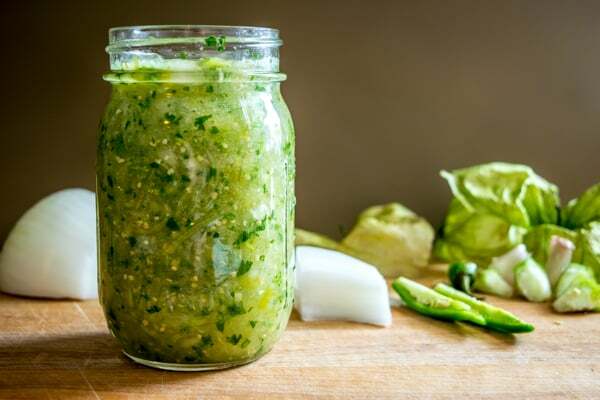 Hi, I would like to make this recipe (TOMATILLO-SERRANO SAUCE) with a dish I am making tonight. If it is okay with you I want to post it on my blog and Instagram. Of course I will give you credit for the (tomatillo sauce portion) of the recipe. Please let me know if it is ok to use this recipe. 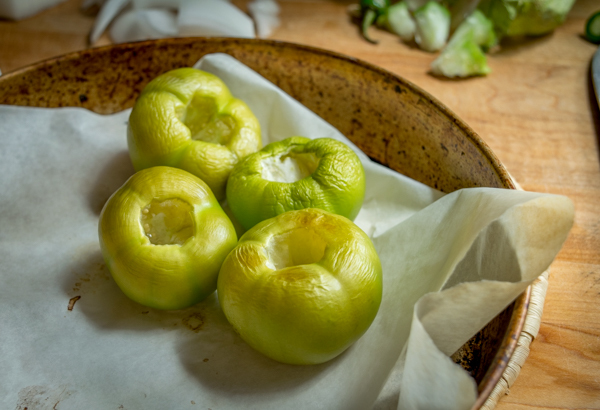 I am making a dish and want to include Tomatillo sauce. Hi Sue, yes go for it and thanks for asking. Feel free to get in touch if you have any questions about it. Cheers. 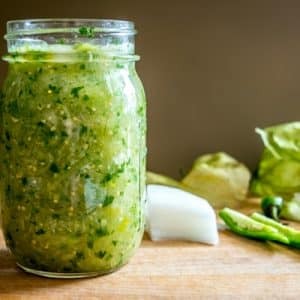 Can this green sauce be used in or as the green sauce for tamales? I love tamales and am about to try my hand at making them, so I was just wondering if this sauce can be used or should I find another recipe? Thanks so much!!! You mean to flavor the filling right? Sure you can use it for that — the Salsa Verde is super versatile and I use it for all sorts of dishes. Cheers. This looks so good! I love Serranos too. I think they have the best flavor and are typically a little hotter than jalapeños. Great article, thank you! Can I leave the pepper out as I am allergic to hot peppers. Let me know if I can help any further. Cheers. This turned out great! I roasted the tomatillos for about 25 minutes and used 1/2 of the pepper. I might add a little line as well but it’s good without it too! Awesome thanks for your note Amber! Yeah, lime and a splash of vinegar are good additions to consider but more often than not I’m happy with just the basic ingredients. Cheers. jalapeno with seeds and pulp to up the heat… heat declines when eaten with companion foods. Very nice overall.. Tomatillos & cilantro must be an acquired taste. I prefer fire-roasted tomatoes instead of Tomatillos. More tang. Might I suggest it be made with any unripe tomato, such as we find in any grocery store year round. Thank you for sharing your recipe.